Colour: Golden yellow – either indicative of age and/or oak treatment. The wine showed moderate ageing, but all agree that it has several years still left. Bouquet: Citrus (lime), nuttiness, nectarine, butterscotch and lanolin notes on the nose. This is still developing and we agreed that it is now only in its secondary stage. Coffee notes appear after a little while in the glass (mocha). Palate: Mouth-coating flavours of butterscotch comes through on the palate with lovely citrus notes and ripe fruit flavours, leading to a pleasant aftertaste. Round and soft, not overly alcoholic, very smooth. Good acidity but still ripe fruit notes even after some time in the glass. 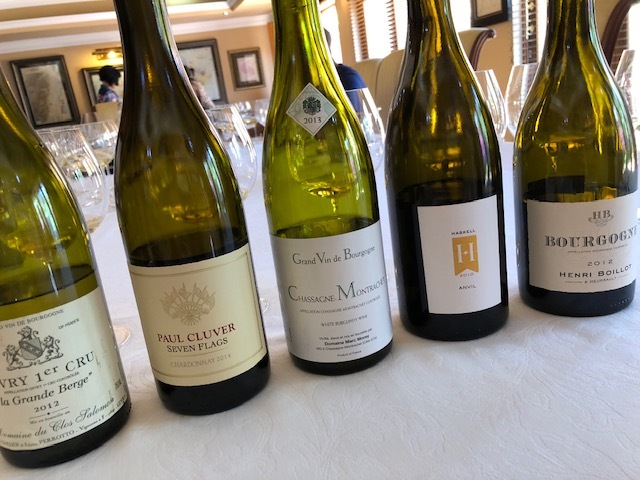 The overall consensus was that this was a well made Chardonnay, showing all the characteristics of the cultivar. Colour: More towards amber (with an orange tint), which can be an indication of age or slight oxidation perhaps. Bouquet: Flinty notes, soft aromas of paint (it reminded Taryn of fibreglass) and bitter orange rind. Funky notes initially, however it became more perfumed with time in the glass – ripe peach notes appear. Palate: Well-made (not in the class of the first wine tasted though) with more prominent aromas and a salty note on the aftertaste. This is a little closed now but might open up with a little time. Colour: Bright yellow colour – showing a bit of viscosity. Bouquet: Lime marmalade, citrus notes are prominent, sherbet (reminiscent of cream soda), crumbled baked cheesecake and some ripe tropical fruit (canned pineapple) come through after a while. Palate: Prominent vanilla, lime/lemon zest and Macadamia nuts. This is clean and fresh with a soft saltiness on the aftertaste. A very well-made wine. Colour: Golden yellow – very slight viscosity. Bouquet: Lime notes on the nose with aromas of candy, more tropical fruit than vanilla notes, grapefruit, stone fruit and honeyed melon. Palate: Tropical fruit notes with good acidity and a slight effervescence on the palate. This is also sweeter on the palate than the previous wines – a lovely and gorgeous wine! We all favoured this as a South African wine. Colour: Darker golden yellow colour. Bouquet: Buttered toast and honey notes with aromas of dried fruits especially apricot – a little closed on the nose still, but this is clearly very elegant and feminine. Palate: Smooth and mouth-filling – soft and elegant. Dried apricots on the palate – absolutely beautiful – a great well-made wine. 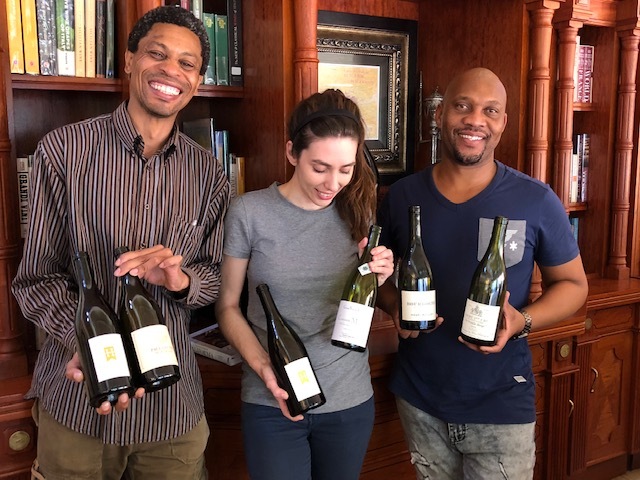 We were all very impressed with how well our local wines from Haskell and Paul Cluver showed against its Burgundian counterparts… it is clear that these Chardonnays are powerhouses that can stand on its own – congratulations to Rianie Strydom and Andries Burger for these beautifully crafted wines!